At this point in the year, grade 8s had just finished their unit on surface area and volume of circles. 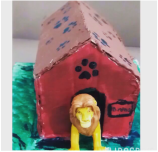 To end the unit it was decided that students would complete a project called the doghouse. The goal of the project was to build a doghouse with the largest volume and surface area using an imaginary 2 sheets of plywood measuring 120 cm x 240 cm. Then build a 1:10 scale model of the doghouse. 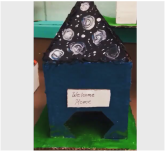 After seeing the examples from Justin, my students were motivated to complete their project. 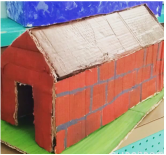 I was further impressed as some students asked to modify the project by adding a pyramid style roof rather than the initial triangle. This addition meant that students had to add further calculations to their doghouse.